Rich peacock colors make a unique expression of appreciation and love. 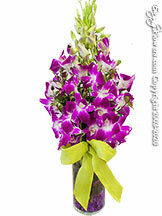 Brimming with long-lasting Cymbidium and Dendrobium orchids, hydrangea, dark blue delphinium and rolled tropical leaves, this design is sure to tickle and delight. Your gift includes both peacock feathers and turquoise gem stones and arrives in a chic, tall square glass vase. 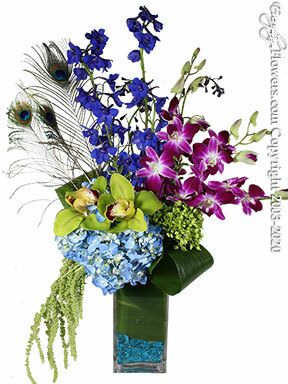 This grouped, contemporary design features orchids, delphinium, hydrangeas and tropical leaves and is arranged in a contemporary glass vase accented with peacock feathers. This was a beautiful arrangement, the purple and blue colors are so vibrant! Beautifully designed product presented by a professionally conducted company-from all fronts--from order to delivery! Loved it, thank you. S-Irvine.